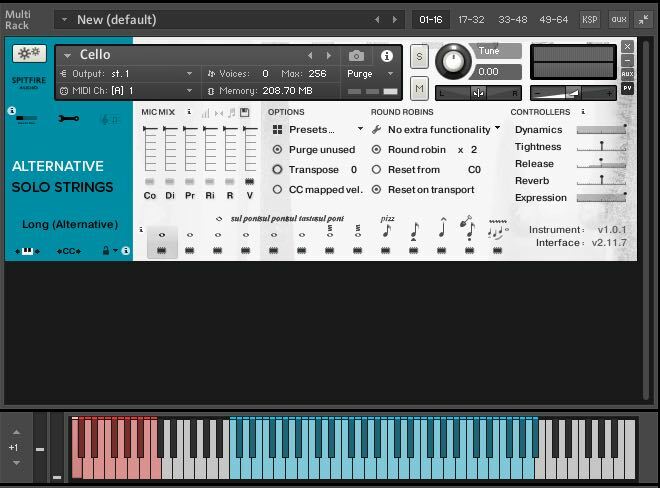 Spitfire Audio’s Alternative Solo Strings – what is it? 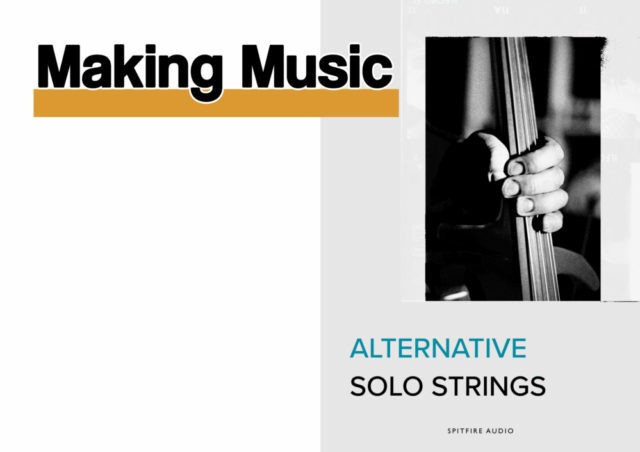 Spitfire’s Alternative Solo Strings is the company’s alternative take on solo string performances featuring Violin, Viola, Cello and Double Bass recorded by world-class players. It uses 28Gb of disk space, but needs double that during installation. 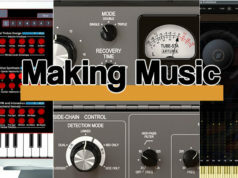 It will run in both Kontakt and the free Kontakt Player version 5.6.8 or higher. Mac users need OS X 10.10 or higher. 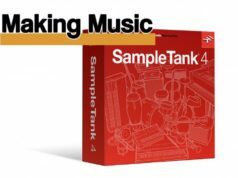 It’s NKS-compatible for users of Native Instruments Komplete Kontrol instruments. So what’s an ‘alternative take’? The names comes from the articulation called “Long (Alternative)” which is the longest articulation in the set. It’s essentially a little performance on its own. For example, a note might start normally and then evolve into a tremolo. Or it might play a little grace note after a few second or sweep up to the note, or sweep down. The production varies from note to note and each note has two round robins for each dynamic layer. You can hear this simply by repeatedly playing a single note but it’s more apparent when you repeat a chord as you’re more likely to get a couple of round robin variations with each play. 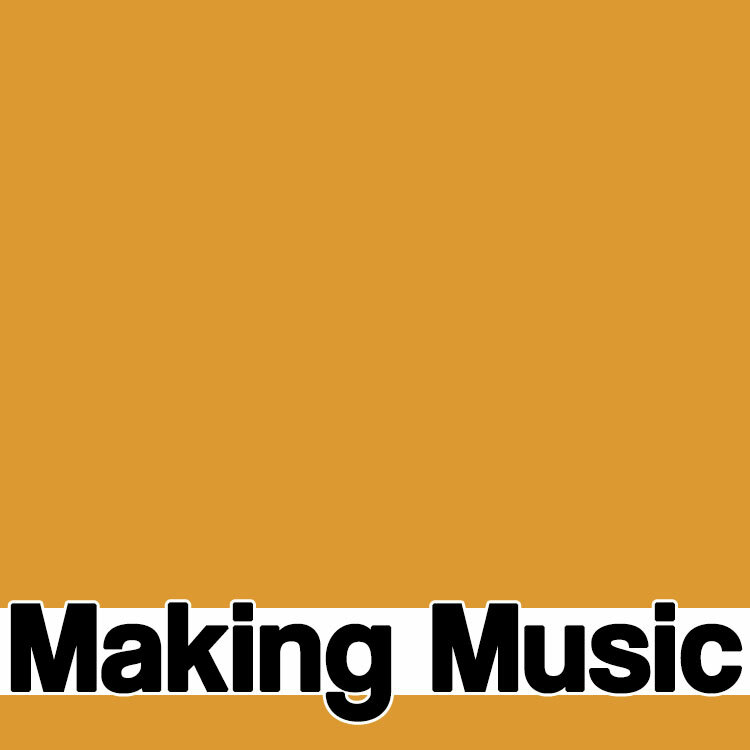 It adds a degree of randomness and unpredictability to the music line. This is not something you might want all the time, especially if you’re composing a ‘tune’. However, it’s very effective for adding character and variation to a piece, particularly slow-moving pieces and underscores. If you do want the same articulation very time, you simply disable the round robin. Although the “Long (Alternative)” is the ‘biggy’ the other articulations also have their own alternative takes. The Long is an arco or sustained note that starts with no vibrato then morphs to a slowly-developing vibrato. Long Harmonics uses a technique that doesn’t fully finger the note causing it to sound an octave higher with a ringing tone. Long Sul Pont (for Ponticello) plays the strings ‘on the bridge’ or near to it which accentuates the higher harmonics creating a glassy sound. You can hear the tone change as the note develops. Long Sul Pont (Dist) starts like a normal long note but the harmonics increase as the bow moves closer to the bridge. Long Sul Tasto involves bowing near the fingerboard and creates a more mellow sound with less vibrato. Tremolo is hopefully self-explanatory. Tremolo Sul Pont plays the string near the bridge creating a more intense effect. There are also four short articulations. Pizzicato ranges from soft plucks to very hard, aggressive ones. Spiccato is the short bow articulation used for those driving ostinato lines. There are nice velocity variations here. Brushed Spiccato is softer with less edge. Spiccato Dig is a very aggressive Spiccato, most apparent at higher velocities, and with a wide variation of tone in the round robins. 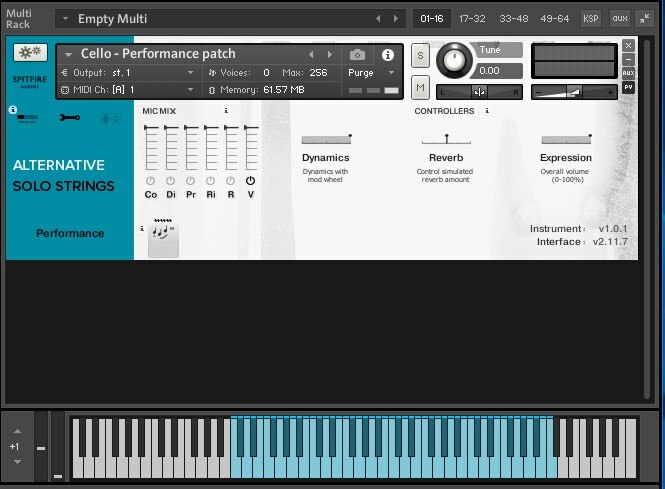 The four main instruments contain all the articulations and, as usual with Spitfire, you can select an articulation in several ways, usually via keyswitches or by clicking on the articulation the interface. If you hold down Shift while clicking, you can select more than one articulation. This vastly increases the range of articulations and there are some super combinations. Try one of the Longs with the Spiccato, for example. You get the nice Spiccato attack but if the riff contains slightly longer notes, say a mixture of 1/16th and 1/4 notes, the longer notes sustain. It’s a really nice effect. There is another articulation, only available for the Violin and Cello, and that’s Performance Legato. This is monophonic and if you play legato, it fills in the transitions for you creating a more realistic effect. As well as the four main instruments, there are several others in sub folders including Performance Legato Violin and Cello. There is also a collection of the individual articulations which makes is easy to select the ones you want to use in a piece rather than using keyswitches. The Economic and Light Resource instruments feature a smaller selection of articulations which are light on RAM and are easier on the CPU. The Time Machine instruments contain all the short articulations fully loaded into RAM enabling you to vary the length of the notes via a MIDI CC (Continuous Controller). You can see where the ‘alternative takes’ come in. Many of the articulations you could use instead of their more traditional counterparts to add variety and a human touch to your music. Others are ideal for slow-moving lines and atmospheric backdrops. If you’ve used any Spitfire libraries before, the interface will be familiar although it has been tweaked to control specific elements of this library. There are no less than six Mic positions. Close is the driest. Dirt is similar but some distortion has been added for extra bite. The Stereo Pair is still close but wider than the other two. The Ribbon Mic is also close but has a warmer sound. The Stereo Room Mic introduces a small room ambience. The Close Valve Mic has a mix of close and room and is the default setting for the instruments. These don’t alter the articulations but they do have an effect on the tone and it’s well worth experimenting with different Mic mixes. In the main interface which Spitfire calls the General Overview, there are also Controls for Dynamics which crossfades between the different dynamic layers in the long articulations, Reverb adds simulated reverb, Release runs between short and long release times, and Expression adjusts the volume and defaults to CC 11. Tightness controls how tight short notes play so as you increase the Tightness, the start cuts further into the note so you get more attack but at the expense of realism. When playing, the manual suggests increasing the tightness so you hear the attack when you play, but then decreasing it and adding a negative delay in your DAW so the note is triggered just before the beat but the attack sounds on the beat. The Expert view adds additional controls for fine tuning. Functions including locking articulations, setting Continuous Controllers and saving Mic presets. The Round Robin section has a few features which may be new to users of other Spitfire libraries. Neighbour Zone RR borrows from, as it says, neighbouring zones so an instrument with, say, 8 round robins would cycle through 24. Layer x2 Round Robins plays two round robins simultaneous so you get a thicker sound, and it drops the volume by around 6dB so the level stays the same. It then moves on by 2 round robins so the available number is effectively halved. Layer x2 With No Skip works the same way but doesn’t skip a round robin and simply jumps ahead 1. You can also set the number of round robins used, from 1-16 depending on how many have been recorded. These give you more control and more variation over the tone and it’s interesting to run through the round robins just to hear the variations. The other feature in the Expert view is the wonderfully-named Ostinatum. It’s a mini sequencer where you can program up to eight rhythms of up to ten steps each. This is probably an under-used feature of Spitfire libraries but it’s well worth spending a few hours with it to see what riffs it can produce. And it’s massive fun. You might have been wondering how alternative a take could be without detracting from the essential solo instrument. Now you know. Spitfire’s Alternative Solo Strings does what it says on the tin. It’s solo instruments with a wide variety of tones, tweaks and articulations that you won’t readily find in other libraries but which still remains eminently useable. Whether you could use it as your main solo string library is debatable. 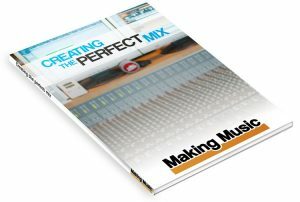 You could at a push but most composers will probably prefer it as an addition to their main solo library. But it’s definitely a wonderful addition which adds an enormous amount of scope to your solo string compositions. Previous articleNews: Eventide Inc.’s Essential Bundle at an essential price.